Unbelievably, Kevin Martin has done it again. The Albertan Team PokerStars Pro Online has seemingly found the God-mode button as he tallies up huge results all year long. 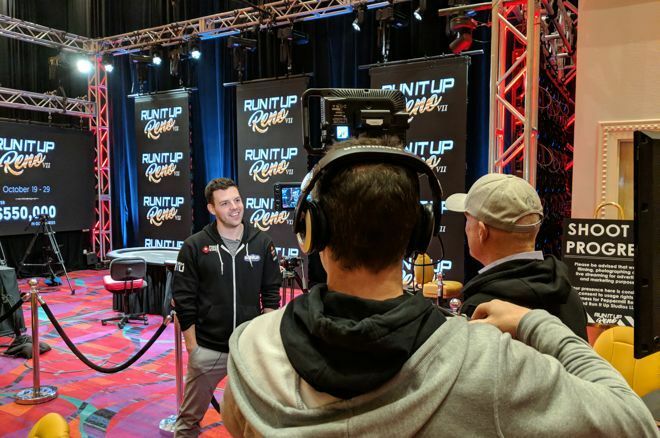 In the early hours of this morning, Martin found himself heads-up against Matt Stout in the Run It Up Reno Main Event. With the cameras broadcasting every moment live to Twitch, and despite viewers overwhelmingly cheering on his side in the match, he ultimately fell in the runner-up position for US$48,210. He’d already finished second in an event at PCA earlier this year and won three (yes, three!) Main Events this summer in Calgary, so most reasonable people would’ve assumed he’d hit his ceiling for the year. Yet he just finished second in Run It Up’s largest Main Event ever, and that finish became his largest prize of the year. Martin’s cashes for 2018 currently sit at just under US$180,000, and that’s with the largest buy-in coming in at only $1,600. These are all small- to mid-buy-in events, making the total winnings a seriously impressive number. Martin’s confidence is high, evident in the fact that he fired six entries into this Run It Up Reno Main Event. Five went in on the first Day 1, and he very nearly didn’t bother trying again on the second Day 1. But girlfriend and Big Brother Canada housemate Pili Nemer urged him to take another shot. Like anyone who makes a large tournament final table, there was luck on his side. But he also displayed excellent judgement and made some incredible calls and folds on his way to the ultimate heads-up battle with Matt Stout, showing that he has really become a high-level player. In the very first hand of their two-player tangle, Martin’s ace-king (which he has famously coined The Church) made a straight on the river of the three-jack-two-four-five board. After betting the final street, he was faced with a shove by Stout. Twitch chat pounded their keyboards with urges to fold as they saw Stout holding ace-six for a better straight. After a long time in the tank, Martin found the fold, but was left with a big chunk of his stack missing. Only a few hands later, he got it all in with king-jack and was snap-called by Stout with ace-seven. The board ran out with neither player pairing and Stout earned the golden cup trophy and $70,000. You can watch the entire Day 2 on Twitch here. It was only a few years ago that Kevin Martin was streaming on Twitch as a self-confessed recreational player. He played small online stakes and put as much focus on drinking and having laughs with his roommates on stream as he did on the poker playing. With results as impressive and consistent as this, it’s pretty hard to argue that Martin hasn’t come a long, long way, and is likely one of the best players in Alberta at this buy-in level. Can he notch a few more cashes before the year is out?